Fruška gora is a low mountain, located mostly in Serbia with a small part of it in Croatia. Its highest point stands at only 539 m2 (1769 ft), but the territory it covers is the impressive 266.72 km2 (102.98 sq mi). Fruska gora in English, pronounced Frushka, is the oldest national park in Serbia, declared as such in 1960. Located at the northern part of Serbia, this is also the only national park in the Vojvodina province. It consists of 15/17 monasteries (depending on the source) and several unexpected sites. The park is very close to the second largest city in Serbia – Novi Sad. It is actually a great escape from the city life if you happen to live around. Furthermore, it is a good choice for hiking and mountain bicycling. The nature is beautiful, but there aren’t any views that will blow your mind. It is mostly trees and a good way to describe the place would be “a large forest”. As a matter of fact, gora in Serbian means forest. 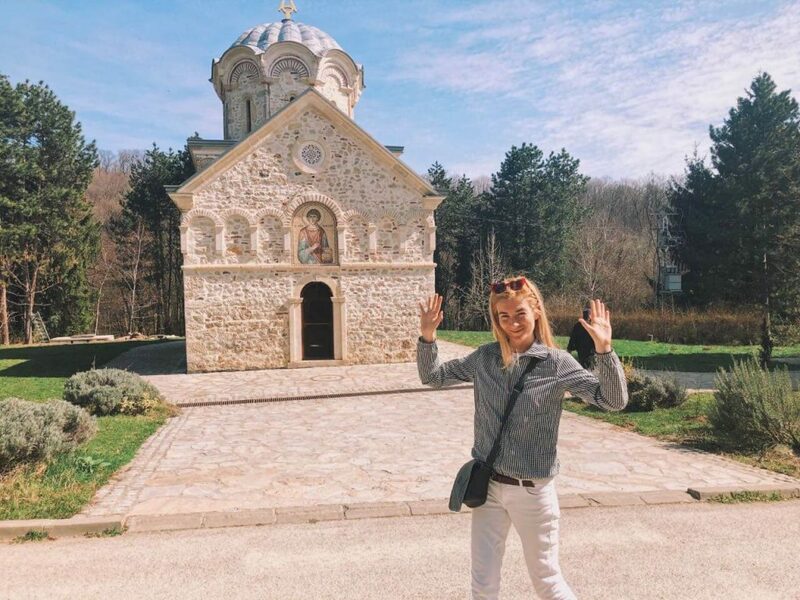 There is no official entrance or fee to enter Fruska gora, but different sites to visit around the small villages here. Upon our trip at the stumbled upon many signs saying either Welcome to Fruška gora or Goodbye. 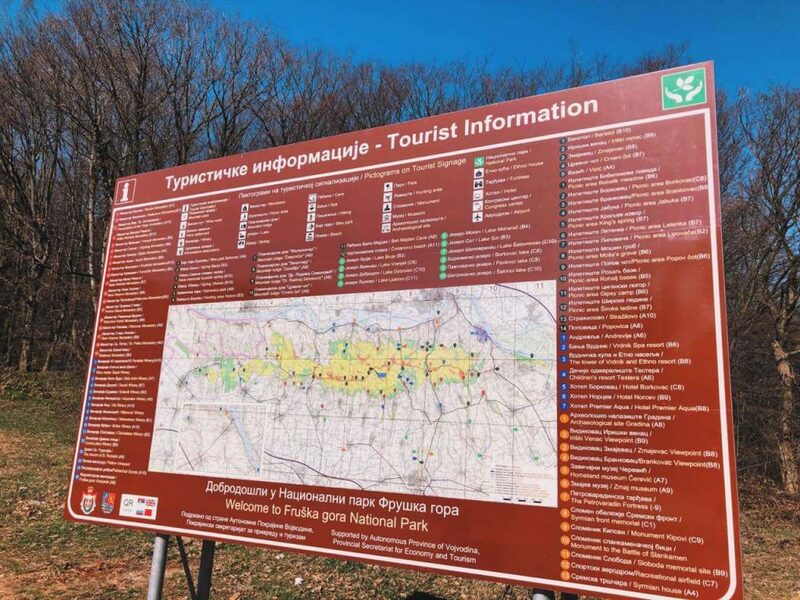 There are also several info points with maps and directions. The closest entrance to Novi Sad comes shortly after crossing the Danube River. 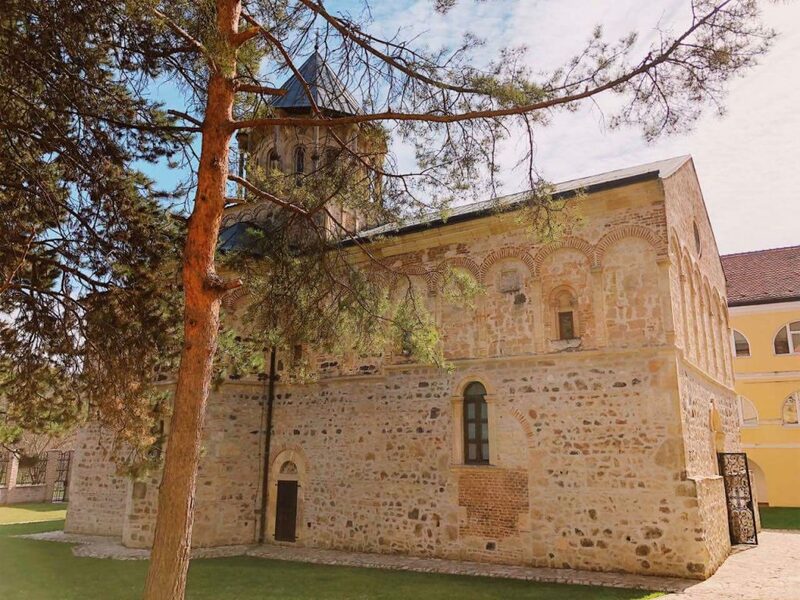 It is where you can see several monasteries, but it is located in a small settlement. Thus, you won’t get the feeling at being at a nature park at all. 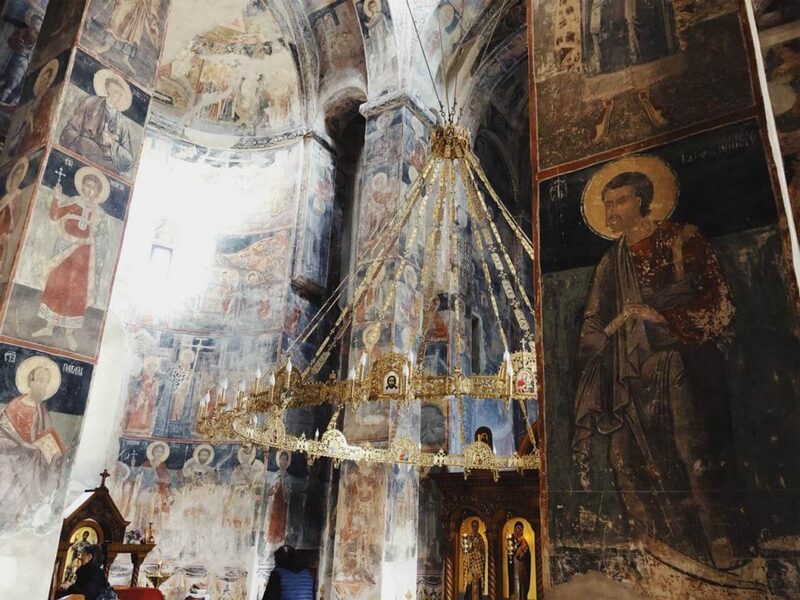 Originally, there were 35 Serbian Orthodox monasteries in Fruska gora, but only 16 survived to present day. 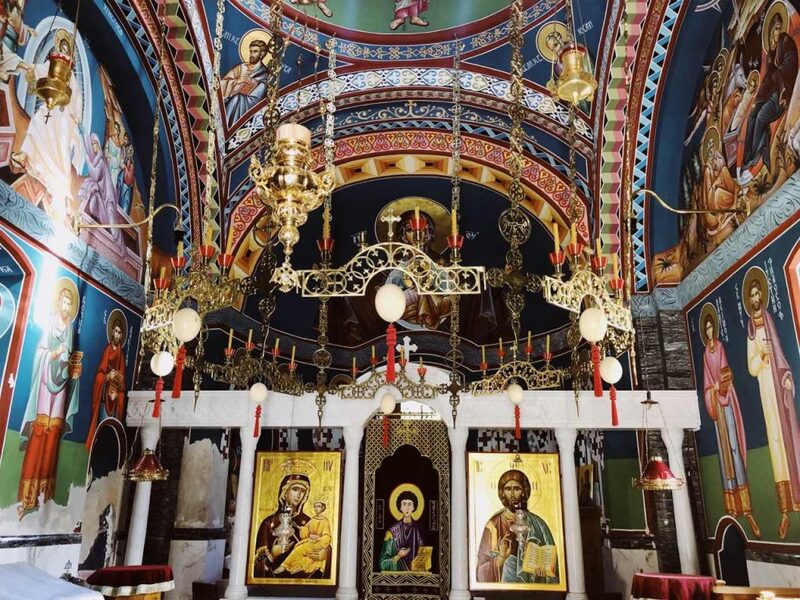 The place is also called the Serbian Mount Athos due to the similarities with the Greek mountain. The monasteries are located in an area of 50 km (31mi). Naturally, it would be really difficult to see all at once, as you’ll need to drive around a lot. 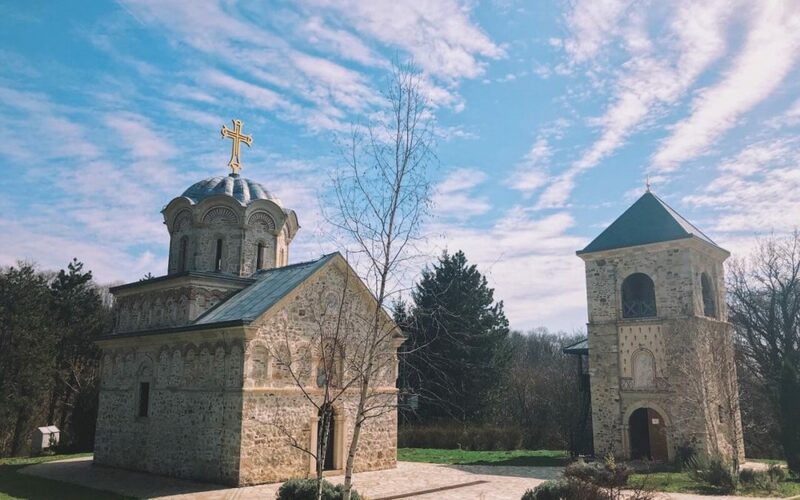 We managed to visit the two monasteries in the villages of Novo Hopovo and Staro Hopovo. These are easy to visit together as they are within 2/3 km (1.5 mi) of each other. The bigger one is in Novo Hopovo, where the monastery church was built in 1576. This place offers local products and alcohol drinks made here. We bought some rakia, a traditional drink in the Balkans, which is very good. 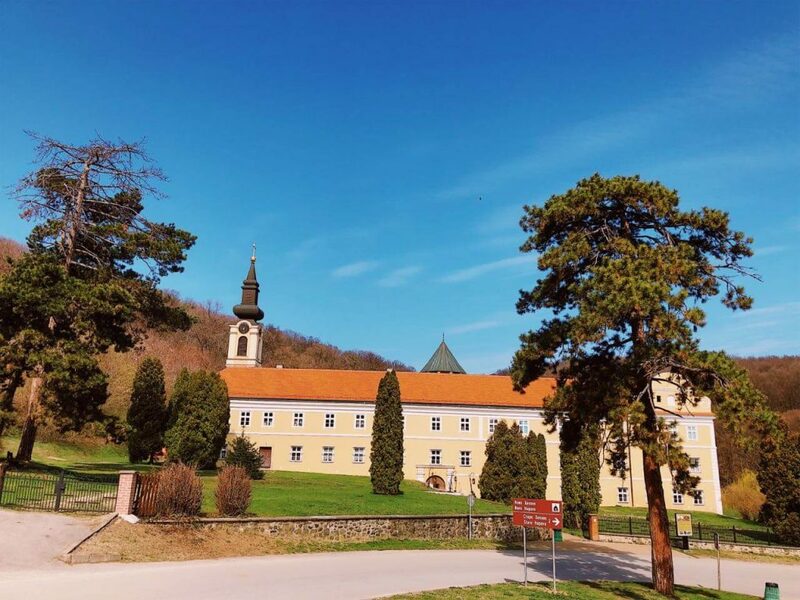 The monastery in Staro Hopovo exists since the middle of 16th century. The small church here is newer, because the older one was sadly destroyed in an earthquake in 1752. 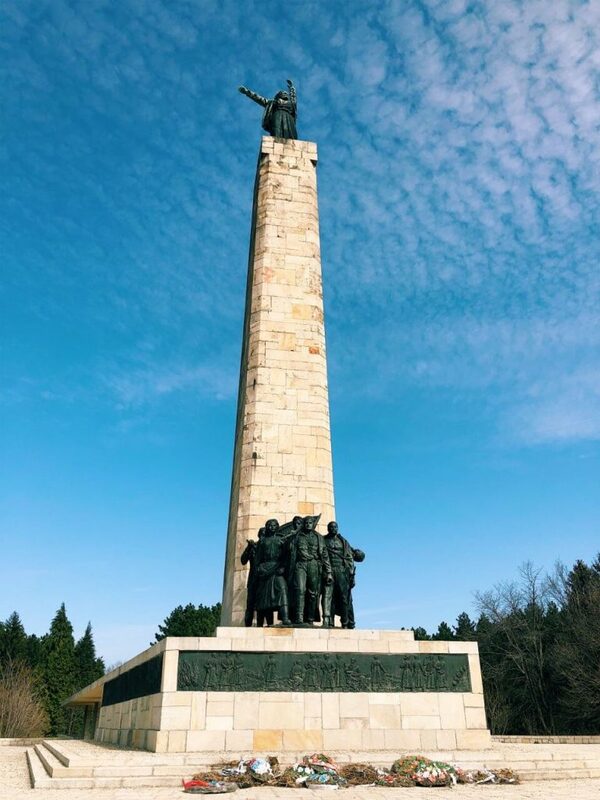 The Sloboda/Freedom memorial site was built in 1951 and is dedicated to the fallen soldiers of the National Liberation War (1941-1945). 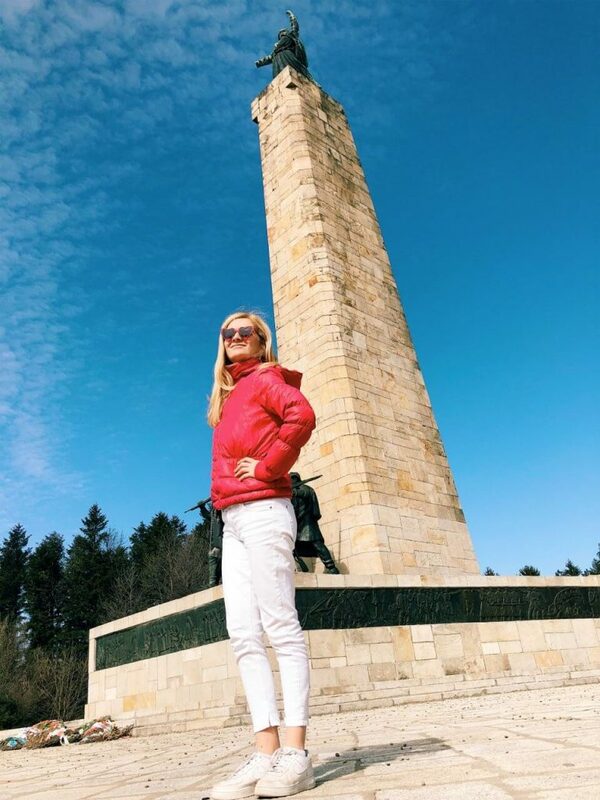 It is a 40-meter obelisk with a woman symbolizing freedom at the top and armed soldiers at the base of the monument. It is a typical socialist monument. We were told that there is a view over Novi Sad from the site, but that wasn’t true. Still, it is next to the road and there are some tables close by, which makes it a proper picnic location. 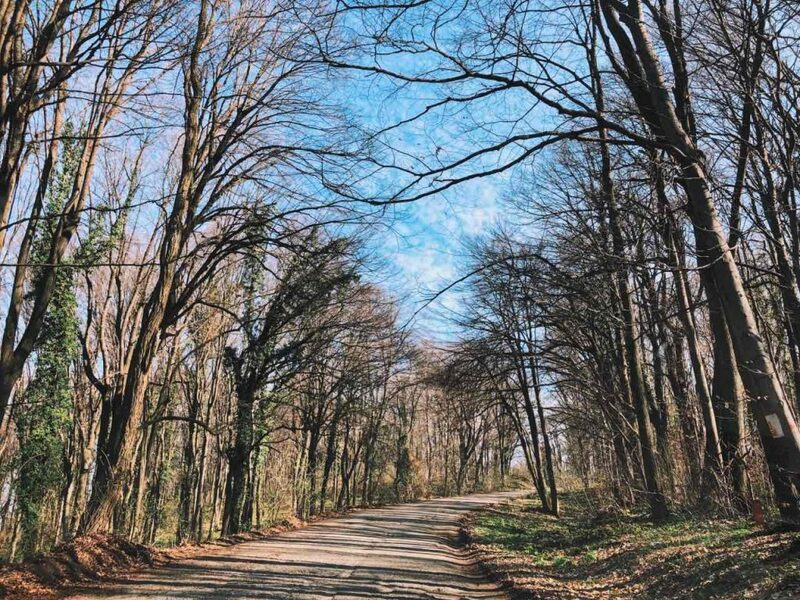 Although there are many roads across Fruska gora, some of them have not been repaid and are not in a good state. Since it is a mountain area, there are ups and downs, as well as a good amount of turns. 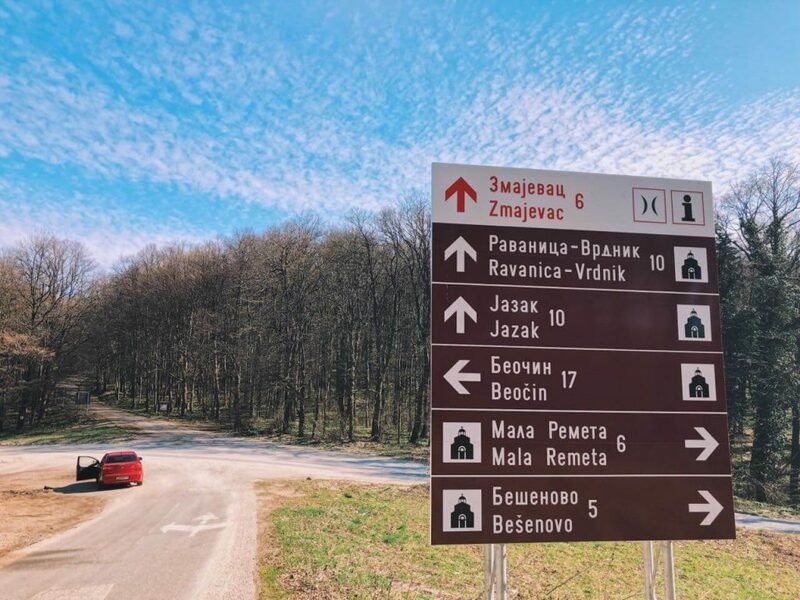 In order to see more sites in Fruska gora, you’ll need to drive around. Alternatively, you could stop at one place and walk to a site or two. As for our trip, we spent more time driving around to reach different locations rather than enjoy the nature or walk. Be sure you plan the places you want to visit in advance, because the park is huge. I was quite excited to check out Fruska gora, only to be left a bit disappointed. I expected more of a touristic area with a nice route to follow, but there were mostly woods. Driving around to find an interesting and worth visiting site was a bit boring and totally not the idea of the trip. We wanted to spend time outside in the nature, but mostly drove around the park. Fruska gora is not the easiest place to visit with a toddler. The routes are not suited for baby strollers. Not that they have to be, but it was another turn-off for us. In my opinion, the best thing to do if you happen to be around is visiting some of the old monasteries. These were definitely interesting and authentic sites that I am happy I saw. Traveling to Serbia? Check out my posts about Belgrade and Novi Sad!